Welcome to The Lumber Room by Wood Source. We’re a branch of one of the biggest exterior wood product distributors in Colorado. 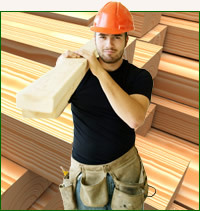 We pride ourselves on our quality lumber materials and knowledgeable staff. We supply our wood products to anyone in the nation. View our wide variety of lumber inventory by selecting from the options below. The Lumber Room by Wood Source is a large distributor of Douglas Fir Beams. We have a large inventory of dry or green beams. We can also surface and/or hand distress the timbers as needed. There isn’t an order too big or too small. Odds & Ends is designed to distribute discounted wood to anybody in general (i.e. contractors, public). We specialize in getting that hard to find wood for less. If you need siding for your house, trim, interior, exterior, paneling, we have it at The Lumber Room. If you need for a customized pattern, we can match it. We can also resaw our material to specific size to fit your specific needs.